Week 2 started for me as it has for the past few days, at midnight. The camera was already on the seafloor taking pictures of Wilmington Canyon off the coast of Ocean City, Maryland when I arrived. It was the longest dive we’ve completed, spanning almost 10 hours of tow time. TowCam took us through some interesting terrain, and I’m excited to take a look at the new images she’s caught for us. 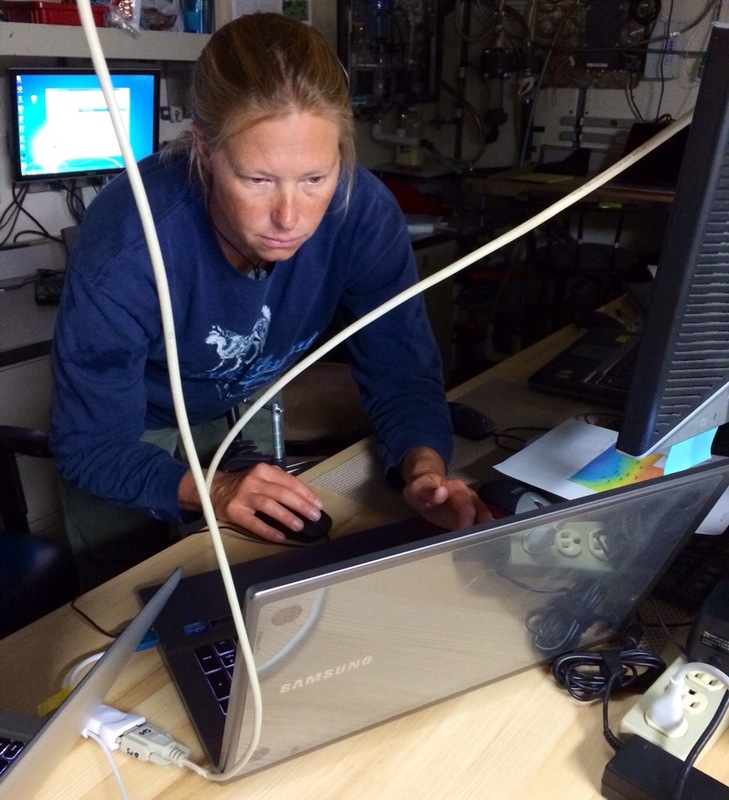 Dr. Lizet Christiansen prepares TowCam for its first dive. In fact, I’ve spent quite a bit of time with TowCam these past few days. I’ve grown curious about where she’s been, where she’s going, and what she does when she’s not here on the Bigelow. Turns out, TowCam is well-travelled, and far from a one-trick pony. This Nikon D7000 is a high-end off-the-shelf DSLR camera that has been modified to operate remotely. It can dive to depths of 6,000 meters thanks to its titanium casing made by Ocean Imaging Systems, which has a high strength-to-weight ratio. It streams low resolution images in real-time and can hold over 5,000 high resolution (16 MegaPixel) images to be retrieved after each tow. 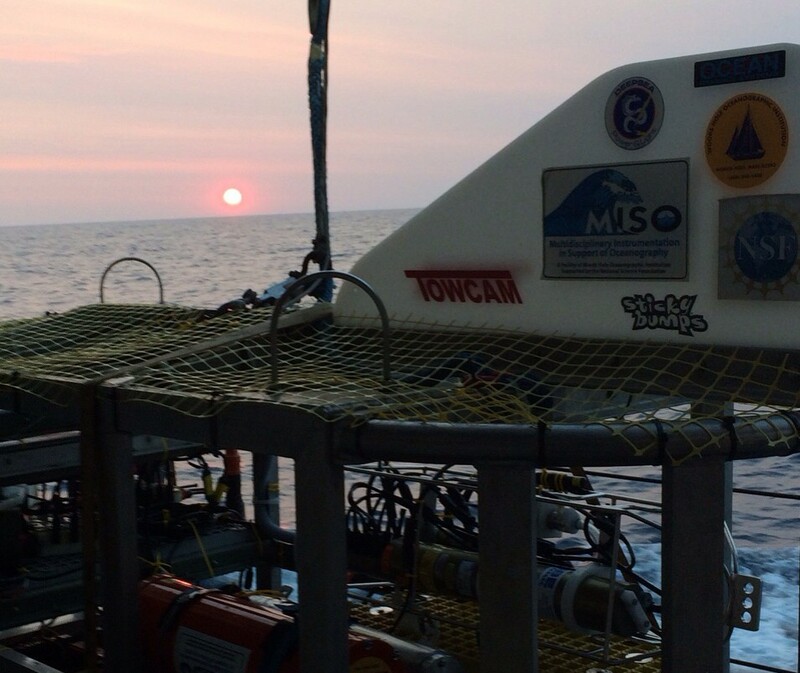 TowCam has worked all over the world, at depths ranging from shallow coastal waters to 6,000 meters. Getting there requires a lot of planning and some interesting travel plans. 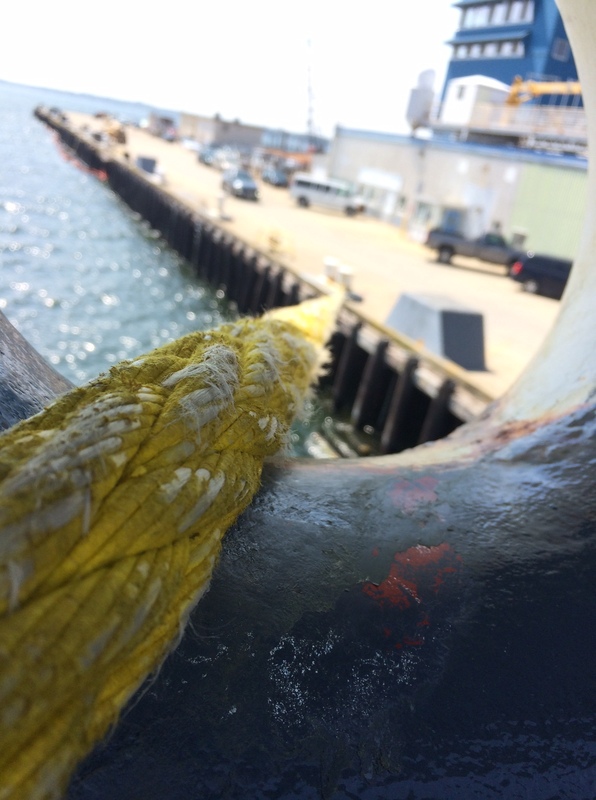 TowCam arrived ready for deployment on the Bigelow by way of a flatbed truck from nearby Woods Hole, Massachusetts. But she is also no stranger to long journeys on freighter ships across the sea. Besides taking beautiful pictures of deep-sea coral, TowCam can also “slurp” biological samples, take CTD data (salinity/conductivity, temperature, and depth), dissolved oxygen, turbidity (visibility), and collect water samples. Click on each of the images below to learn more about each component of TowCam. 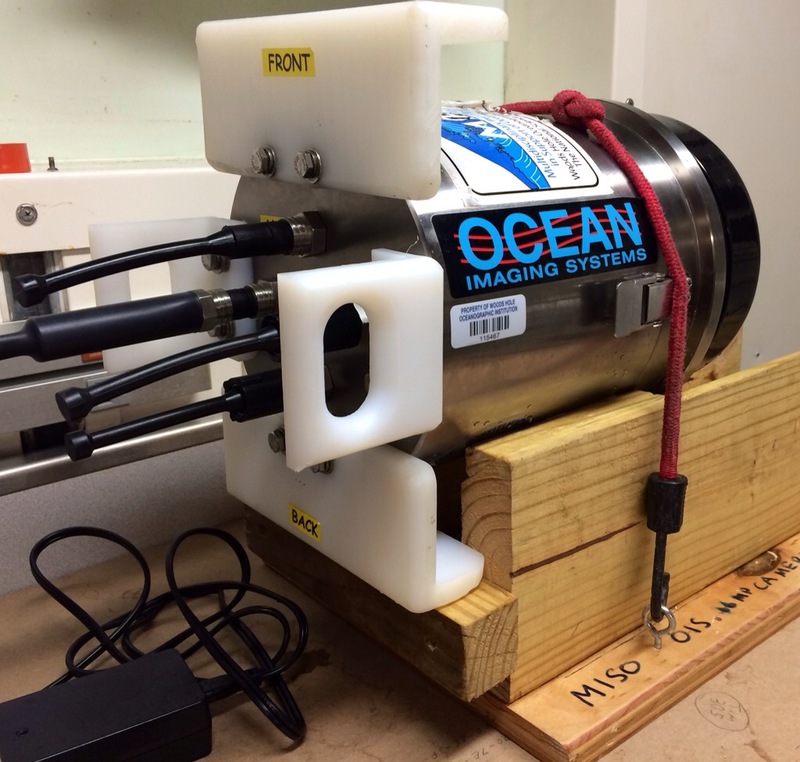 TowCam is owned by the Multidisciplinary Instrumentation in Support of Oceanography (MISO) which is a facility of Woods Hole Oceanographic Institution (WHOI). During the planning of this cruise, Senior Scientist Dr. Fornari, an expert in deep-sea imaging, was contacted to discuss using the TowCam on this expedition. 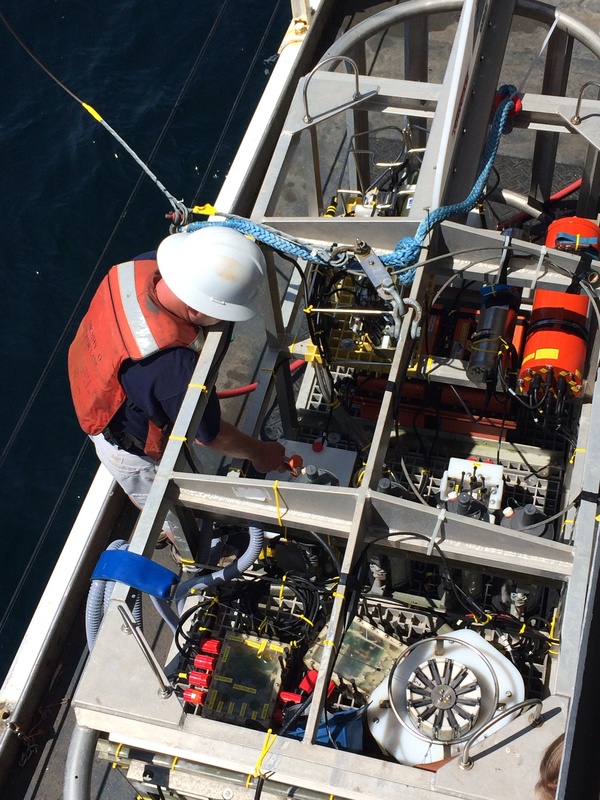 WHOI contracted the TowCam engineers from Seafloor Investigations, LLC (SFI) to operate the system, bringing Mr. Kurras and Dr. Christiansen and out to the Bigelow. Gregory Kurras started SFI after decades in the field, and is an outdoor enthusiast. Dr. Lizet Christiansen is an avid skier, and owns Gear & Grind Cafe in Tahoe City, California. The TowCam narrative could hardly be considered complete without a brief word on TowCam’s operators. Without them, we could only guess at the wildlife beneath our feet. Dr. Lizet Christiansen and Gregory Kurras of SFI joined us from California and Hawaii respectively, and are an incredibly important part of the research team. 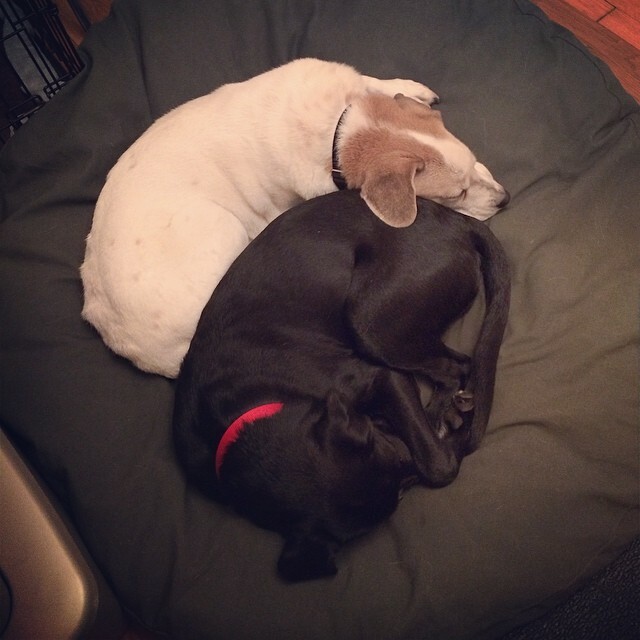 Both spend much of their careers at sea studying the ocean floor as geophysicists, and own businesses back home. Kurras owns SFI, and Dr. Christiansen owns Gear & Grind Cafe in Tahoe City, where customers are treated to pour-over coffee and locally-made ice cream. If you look closely, you can see two Pilot Whales swimming just below the surface. Who could sleep through that? Recording TowCam stats. Photo credit Dr. Martha Nizinski. On the morning of my second-to-last watch, I awoke to learn that many changes had taken place since I last saw my team. In the night, fishermen laid long lines from Hendrickson to Lindenkohl Canyons, leading to a flurry of new plans and a reroute of the night’s dive plan. Long line fishing involves one long line laid parallel to the ocean surface, with several shorter lines called snoods hanging off the main line with hooks on the ends. With these long lines in place, our existing dive route needed a change. After multiple discussions among the science team and between the chief scientist and the bridge, we decided on an alternate location for our 4 AM dive. Dr. Brian Kinlan (of video-chat fame), quickly produced a new dive plan and rearranged our dive schedule to make the most of our last day at sea. Changes with such short notice are not easy on a ship, but I am learning that they are none-the-less commonplace as the environment is constantly shifting. As my Teacher At Sea guide suggested, flexibility is of utmost importance while at sea. The ability to quickly adapt to changing situations can be attributed to the preparation that is done even before the ship left the dock. Dr. Kinlan and Matt Poti, both from the NOAA National Centers for Coastal Ocean Science (NCCOS) Biogeography Branch in Silver Spring, MD, spent years before this cruise sifting through large repositories of data from NOAA, USGS, NASA and other government agencies to extract the specific environmental variables that may influence the distribution of deep-sea corals, including seafloor type, nutrients, temperature, salinity, currents and food particles. 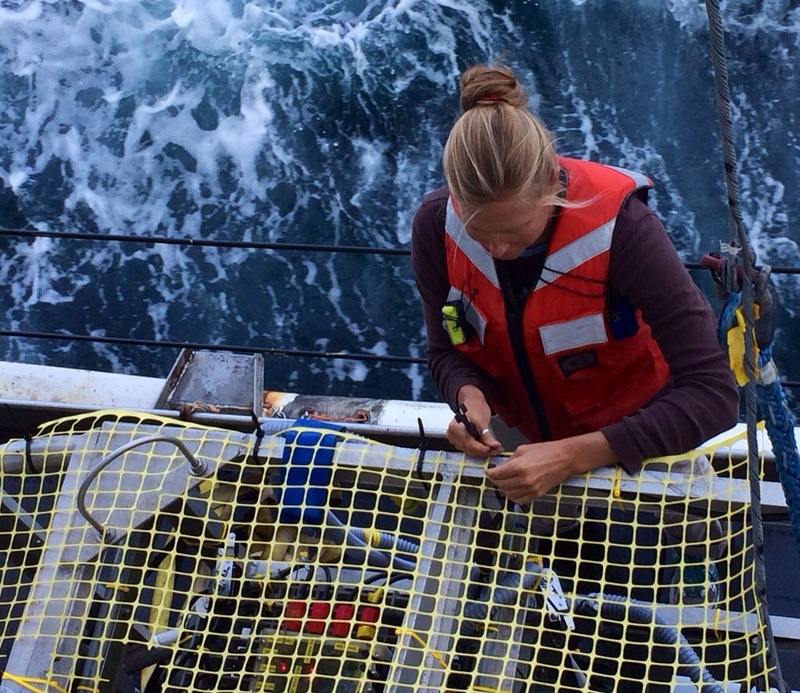 These data came from a huge variety of scientific instruments ranging from satellites to underwater robots to sediment grabs and sensors attached to bottom trawls. 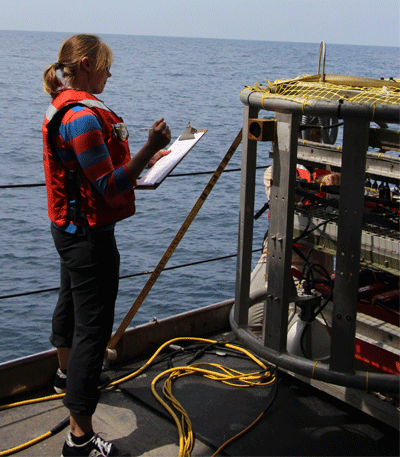 They put these data together with information on where deep corals had been collected or observed in the past. When they had reached the limit of their human brains, they wrote a type of computer program called a “machine learning” algorithm to teach the computer to find corals. This is a kind of predictive habitat distribution model often used as a tool for conservation. So far, Matt and Brian have written these models for the whole Atlantic coast of the U.S. and the Gulf of Mexico. One of the goals of this cruise is to test these models, and ultimately to improve them, so that they can be used to better protect and conserve deep-sea corals. The deep coral model is basically a three-dimensional map that predicts the likelihood of coral based on depth, slope and other characteristics of the environment like temperature and salinity. Because deep-sea corals do not benefit from photosynthesis as shallow-water corals do, they tend to prefer areas with high currents that can deliver food particles and also keep sediments from clogging the coral’s delicate feeding structures. Color indicates depth, and helps predict coral habitats. Overview of dives on this mission. On the ship, Brian and Matt use special 3D visualization software called Fledermaus to view the model results in 3D overlaid on top of very accurate maps of the seafloor collected by an instrument called a multibeam sonar, the same technology used to find and map shipwrecks like the Titanic. 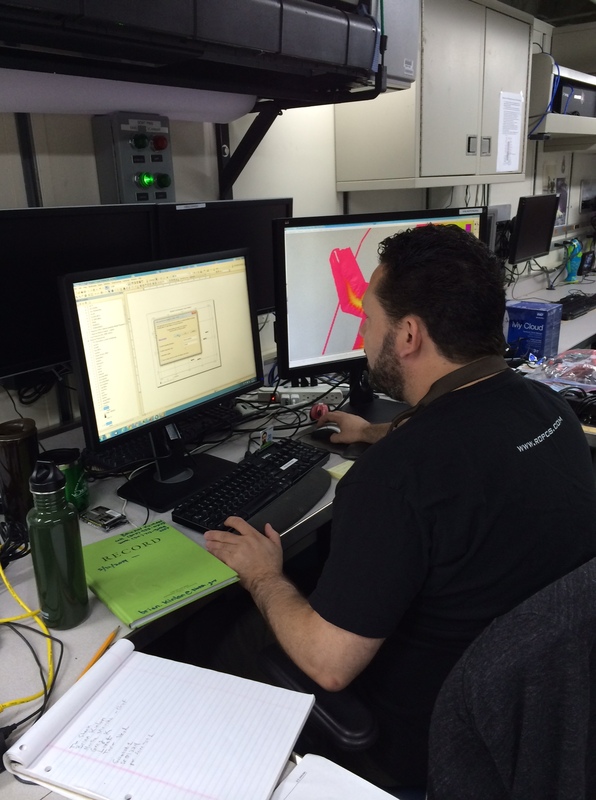 Fledermaus software allows scientists to explore to complex 3D environments. The software can also connect directly to the ship’s navigation system to help guide TowCam to the exact spot needed to test the coral models. All models have their limitations, and their ability to predict coral habitats is only as good as the data they are given. “Machine learning” only gets us in the neighborhood of good coral habitat, not to the specific address. Multibeam sonar gives us a detailed 3D picture of the ocean floor, and without it, we’d be lost searching for coral in the deep ocean. 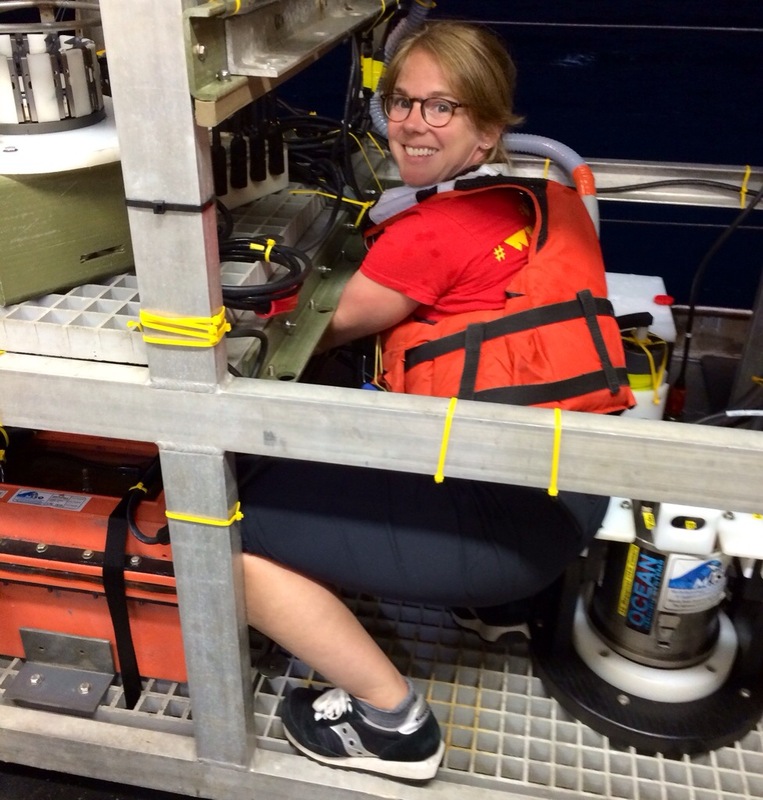 Multibeaming is a process used to gather data about the ocean floor. While you can certainly see many of the canyons we studied on Google Earth, the detail of its bathymetry (topography of the ocean floor) is still just an approximation and could not be used to locate the coral as we have done on this trip. 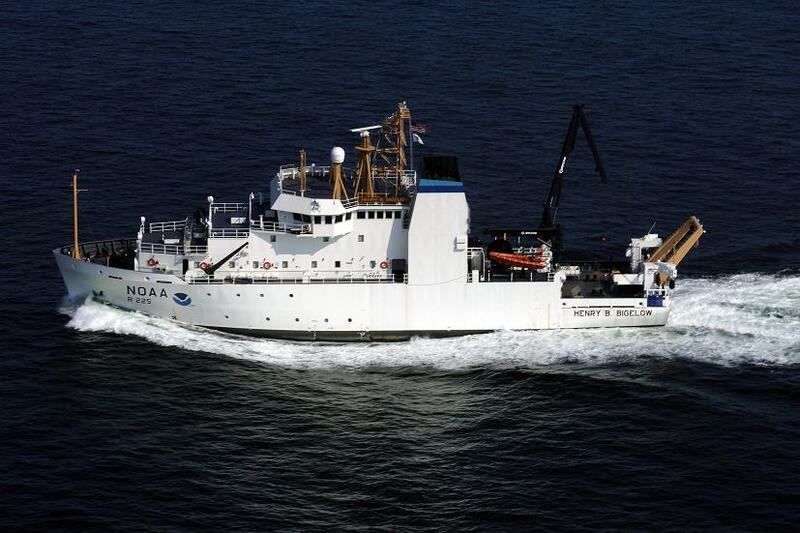 To build a more accurate chart of the ridges and valleys of the ocean floor, you would need to use the data generated by the Bigelow and several other NOAA ships with multibeaming capability. Much of this data is available to the public, and can be imported into the Geographic Information System (ArcGIS) software and even converted to KML (Keyhole Markup Language) files that can be used in Google Earth. I plan to create a lesson using this data, but the capabilities are numerous. 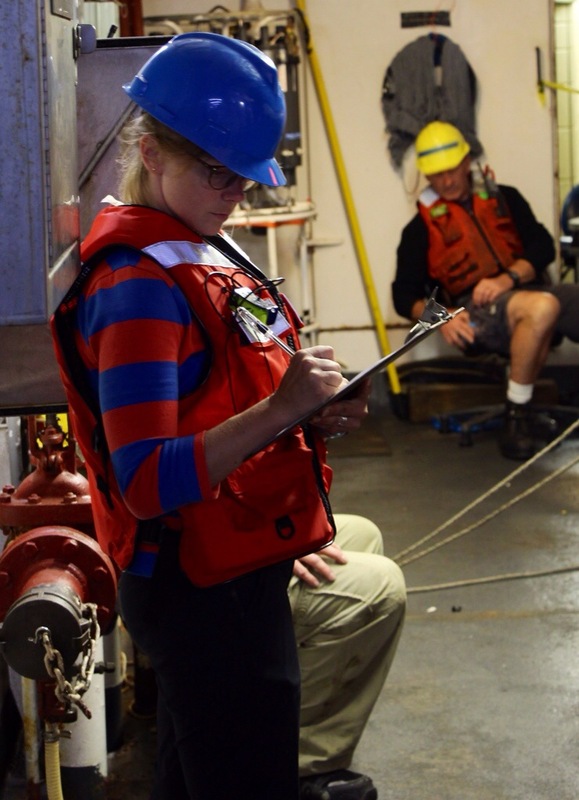 Even with all this technology available, I was surprised to learn that paper charts and hand-held tools are still regularly used for navigation. While visiting the bridge one afternoon, I found Commander Miller in the midst of dead reckoning. Dead reckoning is a process that determines current position, and aids in the planning of future movements while in transit. Straight pattern and one-handed dividers are tools used for dead reckoning. Commander Miller first plotted our “fix” (or current location) directly on the paper chart with a pencil, then used the one-handed divider shown above along with known speed and heading to predict future locations along our path. 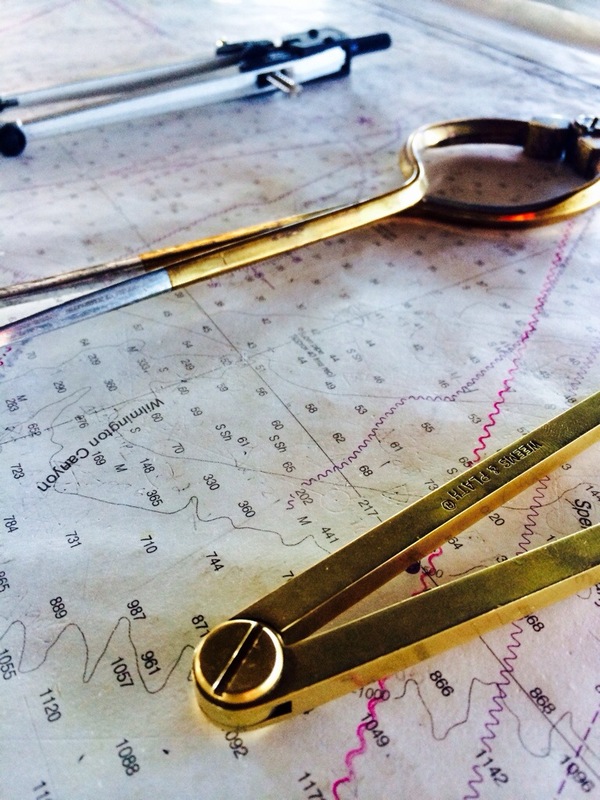 Furthering my appreciation for the need for both preparation and flexibility at sea, paper charts are still used in conjunction with modern technology to ensure that unforeseen circumstances never interfere with navigation and safety. During my online training for Teacher At Sea, I was also surprised to learn that the NOAA Corps is one of seven uniformed services of the United States. I was curious to learn more. The officers on the Bigelow were kind enough to take a few moments to talk with me about their experience and the path that led them to the NOAA Corps. After hearing their stories, I found myself wishing I had been aware of the NOAA Corps earlier as I am certain I would have applied myself. I’d like to take a few moments to ensure that my own students know about this opportunity, and get a bit of advice for using their precious time in high school to set themselves up for success and a possible career in the prestigious NOAA Corps. Commander G. Mark Miller was a Marine Science: Geology major. During college, he spent much time at sea through his participation in Semester At Sea, a research diving internship, and other opportunities. After calling the NOAA Dive Center, he learned of the corps. To any interested high school student, he recommends becoming well-rounded through participation in sports, clubs, and extracurricular activities, and to look for leadership opportunities. Lieutenant Commander Chad Cary was an Environmental Science major, with a Master’s degree in Geography. He enjoyed science and was interested in a career that had an influence on sustainability. His advice to interested high school students is to “reach out to the NOAA Corps recruiting office, ” and to find opportunities to volunteer if near a NOAA port or office. Lieutenant Jeff Pereira was a Meteorology major, and learned of the NOAA Corps through a college classmate. He states that he always wanted to work for NOAA, and thought that the corps “was the perfect combination of science and duty to country.” He recommends volunteering on a NOAA ship, because “more than likely, one of your first tours is going to be on a NOAA ship. Ensign Erick Estela Gómez was an Environmental Science major and spent time in the Peace Corps as well as working in ecotourism. Ensign Estela Gómez was drawn to the NOAA Corps through his love of science and the outdoors as well as his belief in public service. To any interested high school student, he suggests keeping up with math and science classes, and finding internship opportunities. In full survival gear during our first “abandon ship” drill. 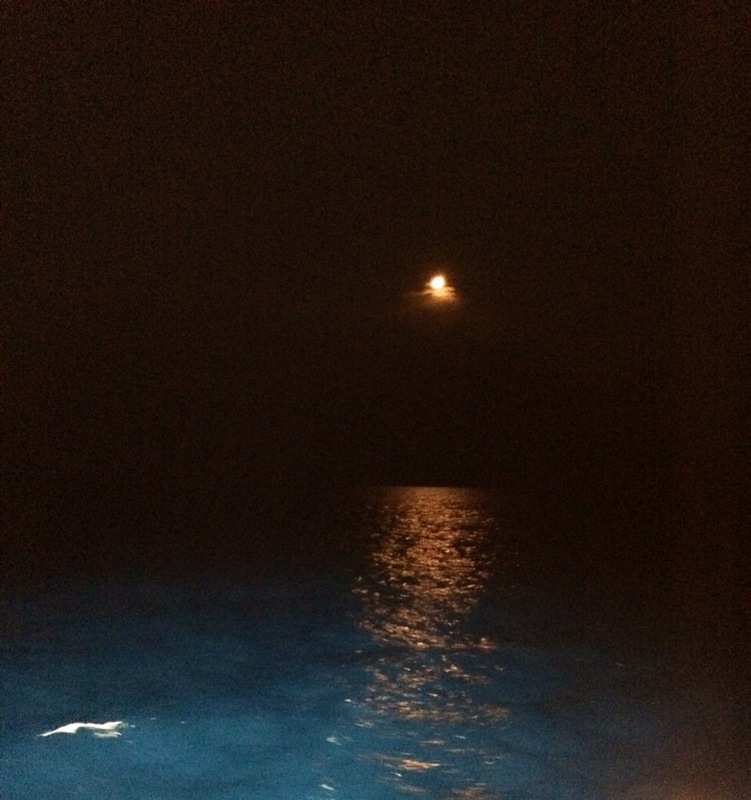 After almost a full day at sea, we are only hours away from the first watch and the first glimpse of data. Preparations commence, and anticipation is high. 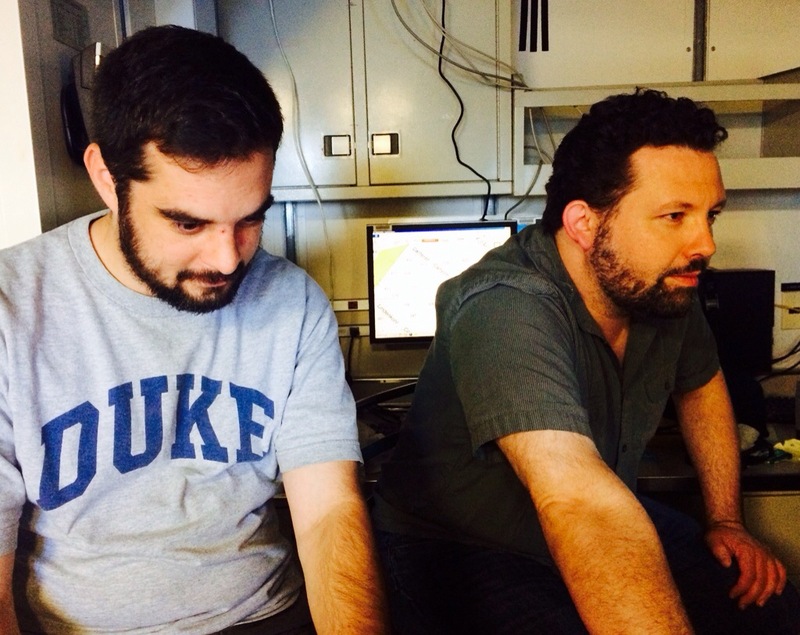 For the next two weeks, we’ll study the deep-sea corals that occur in submarine canyons off the east coast. They have been found in every region of the United States, but for this mission we’ll target canyons in the Northeast region, investigating canyons east of New Jersey, Delaware, Maryland, and Virginia. Deep-Sea Corals are similar to the familiar shallow-water corals, but cannot harness sunlight for energy through photosynthesis. Instead, they rely on nutrients from the water including detritus (non-living organic matter) and plankton. 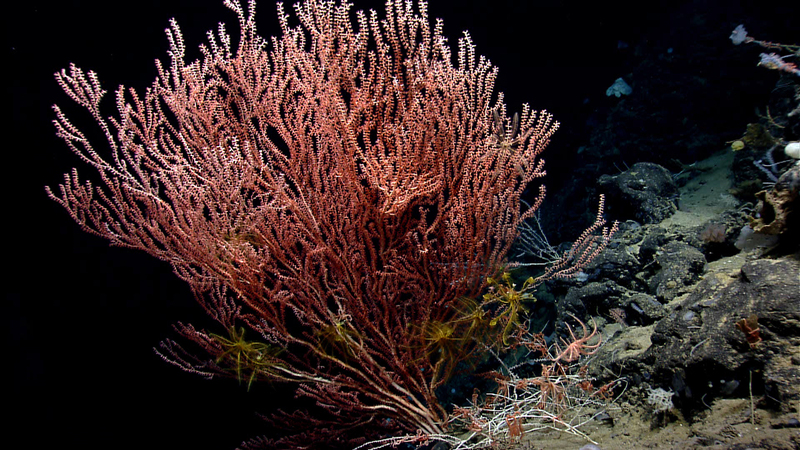 It is believed that Deep-Sea Corals find both shelter and bountiful grub on the steep-sided canyon walls where the faster-moving currents bring in the day’s meal. Surprisingly, many are just as beautiful and colorful as their shallow-water counterparts, like this bamboo coral photographed at Mytilus Seamount during the NOAA OER US Northern Canyons mission last year. Bamboo Coral (Jasonisis sp.) Photo credit NOAA. Though not the hot snorkeling destination, the Deep-Sea Corals in this region are important habitat providers as well as sensitive indicators of ecosystem health. They are long-living but slow-growing and do not recover quickly. Both bottom trawling and possible energy harnessing (off-shore wind farms and oil and gas acquisition) are possible threats to their survival. Because bottom trawling is so detrimental to the coral communities, we’ll use TowCam to survey the area. 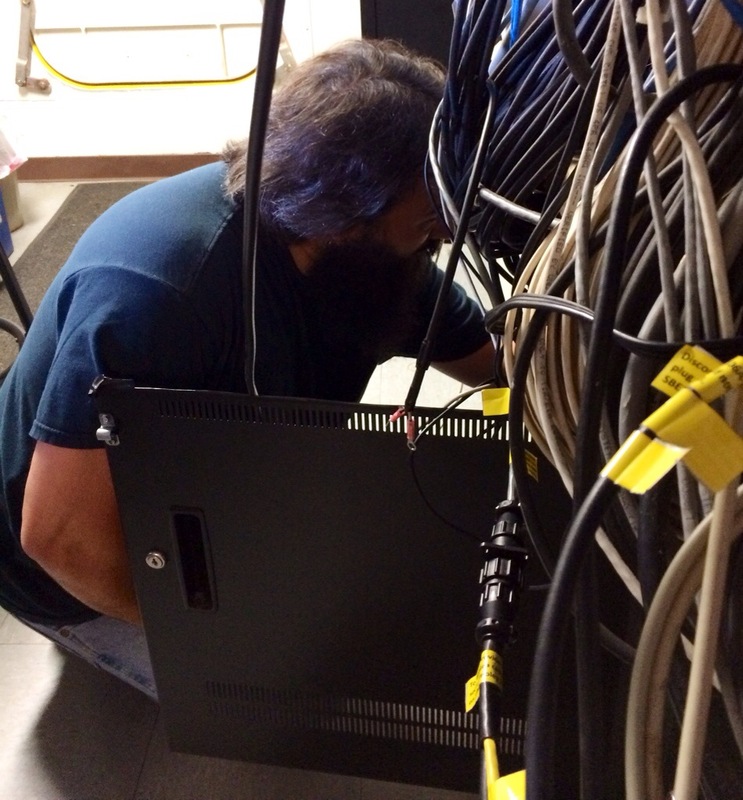 Deploying the TowCam is a delicate process, with sensitive and pricey equipment on the line. 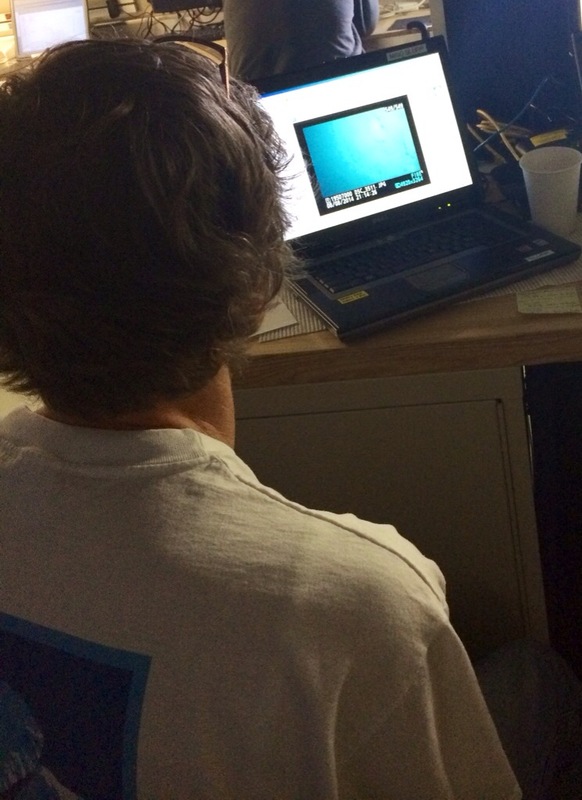 After a few test deployments yesterday, the team began picking our dive locations. There is plenty to consider when finding a dive spot, including the topography of the sea floor and slope of the canyon walls. We also use the results generated by a habitat suitability model that predicts where deep-sea corals are likely to occur. Scientists must strike a balance between the steeper, high-probability cliffs and the gentler slopes. The crew prepares TowCam for the first test deployment. Brian Kinlan using Fledermaus to plan our first dive. Life aboard a ship is surely not easy. The constant rocking and clanging of cold metal will take a while to get used to, and I will sadly miss many daytime hours with our 12 hours on-12 hours off watch schedule. And while waking at 3 AM to greet a deathly dark ocean view may not seem like summertime fun to most, this first morning underway has convinced me that a couple weeks at sea is a treat I won’t soon forget.